A wood-decay fungus is any species of fungus that digests moist wood, causing it to rot. Some species of wood-decay fungi attack dead wood, such as brown rot, and some, such as Armillaria (honey fungus), are parasitic and colonize living trees. Excessive moisture above the fibre saturation point in wood is required for fungal colonization and proliferation. Fungi that not only grow on wood but permeate its fibrous structure and actually cause decay, are called lignicolous fungi. In nature, this process causes the breakdown of complex molecules and leads to the return of nutrients to the soil. Various lignicolous fungi consume wood in various ways; for example, some attack the carbohydrates in wood and some others decay lignin. The rate of decay of wooden materials in various climates can be estimated by empirical models. Wood-decay fungi can be classified according to the type of decay that they cause. The best-known types are brown rot, soft rot, and white rot. Each produce different enzymes, can degrade different plant materials, and can colonise different environmental niches. The residual products of decomposition from fungal action have variable pH, solubility and redox potentials. Over time this residue will become incorporated in the soil and sediment, so can have a noticeable effect on the environment of that area. Brown-rot fungi break down hemicellulose and cellulose that form the wood structure. Cellulose is broken down by hydrogen peroxide (H2O2) that is produced during the breakdown of hemicellulose. Because hydrogen peroxide is a small molecule, it can diffuse rapidly through the wood, leading to a decay that is not confined to the direct surroundings of the fungal hyphae. As a result of this type of decay, the wood shrinks, shows a brown discoloration, and cracks into roughly cubical pieces, a phenomenon termed cubical fracture. The fungi of certain types remove cellulose compounds from wood and hence the wood becomes brown colour. Brown rot in a dry, crumbly condition is sometimes incorrectly referred to as dry rot in general. The term brown rot replaced the general use of the term dry rot, as wood must be damp to decay, although it may become dry later. Dry rot is a generic name for certain species of brown-rot fungi. Brown-rot fungi of particular economic importance include Serpula lacrymans (true dry rot), Fibroporia vaillantii (mine fungus), and Coniophora puteana (cellar fungus), which may attack timber in buildings. Other brown-rot fungi include the sulfur shelf, Phaeolus schweinitzii, and Fomitopsis pinicola. Brown-rot fungal decay is characterised by extensive demethylation of lignins whereas white-rot tends to produce low yields of molecules with demethylated functional groups. There are very few brown rot fungi in tropical climates or in southern temperate zones. Most brown rot fungi have a geographical range north of the Tropic of Cancer (23.5° latitude), and most of these are found north of the 35° latitude, corresponding to a roughly boreal distribution. Those brown rot fungi between latitudes 23.5° and 35° are typically found at high elevations in pine forest regions, or in coniferous forest regions such as the Rocky Mountains or the Himalayas. Soft-rot fungi secrete cellulase from their hyphae, an enzyme that breaks down cellulose in the wood. This leads to the formation of microscopic cavities inside the wood, and sometimes to a discoloration and cracking pattern similar to brown rot. Soft-rot fungi need fixed nitrogen in order to synthesize enzymes, which they obtain either from the wood or from the environment. Examples of soft-rot-causing fungi are Chaetomium, Ceratocystis, and Kretzschmaria deusta. Soft-rot fungi are able to colonise conditions that are too hot, cold or wet for brown or white-rot to inhabit. They can also decompose woods with high levels of compounds that are resistant to biological attack. 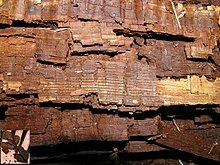 Bark in woody plants contains a high concentration of tannin, which is difficult for fungi to decompose, and suberin which may act as a microbial barrier. The bark acts as form of protection for the more vulnerable interior of the plant. Soft-rot fungi do not tend to be able to decompose matter as effectively as white-rot fungi: they are less aggressive decomposers. White-rot fungi break down the lignin in wood, leaving the lighter-colored cellulose behind; some of them break down both lignin and cellulose. As a result, the wood changes texture, becoming moist, soft, spongy, or stringy; its colour becomes white or yellow. Because white-rot fungi are able to produce enzymes, such as laccase, needed to break down lignin and other complex organic molecules, they have been investigated for use in mycoremediation applications. There are many different enzymes that are involved in the decay of wood by white-rot fungi, some of which directly oxidize lignin. The relative abundance of phenylpropane alkyl side chains of lignin characteristically decreases when decayed by white-rot fungi. It has been reported that the oyster mushroom (Pleurotus ostreatus) preferentially decays lignin instead of polysaccharides. This is different from some other white-rot fungi, e.g., Phanerochaete chrysosporium, which shows no selectivity to lignocellulose. Honey mushroom (Armillaria spp.) is a white-rot fungus notorious for attacking living trees. Pleurotus ostreatus and other oyster mushrooms are commonly cultivated white-rot fungi, but P. ostreatus is not parasitic and will not grow on a living tree, unless it is already dying from other causes. Other white-rot fungi include the turkey tail, artist's conk, and tinder fungus. White-rot fungi are grown all over the world as a source of food – for example the shiitake mushroom, which in 2003 comprised approximately 25% of total mushroom production. ^ Harris, Samuel Y. (2001). Building Pathology: Deterioration, Diagnostics, and Intervention. John Wiley & Sons. p. 106. ISBN 978-0-471-33172-8. ^ "Wood Decay in Living and Dead Trees: A Pictorial Overview" (PDF). Retrieved 2018-02-28. ^ Viitanen, T. et al. (2010). Towards modelling of decay risk of wooden materials. European Journal of Wood and Wood Products 68:303-313. ^ a b c d J. Deacon, Wood decay and wood-rotting fungi. University of Edinburgh (2005?). ^ a b c Microorganisms causing decay in trees and wood. University of Minnesota. ^ a b c Vane, C. H., et al. (2005). "Decay of cultivated apricot wood (Prunus armeniaca) by the ascomycete Hypocrea sulphurea, using solid state 13C NMR and off-line TMAH thermochemolysis with GC–MS." International Biodeterioration & Biodegradation 55(3): 175-185. ^ a b Stamets, Paul (2005). Mycelium running: how mushrooms can help save the world. Random House, Inc. pp. 83–84. ISBN 978-1-58008-579-3. ^ a b Vane, C. H., et al. (2001). "The effect of fungal decay (Agaricus bisporus) on wheat straw lignin using pyrolysis–GC–MS in the presence of tetramethylammonium hydroxide (TMAH)." Journal of Analytical and Applied Pyrolysis 60(1): 69-78. ^ Ryvarden, Leif (1993). "Tropical polypores". In Isaac, Susan. Aspects of Tropical Mycology. British Mycological Society. Symposium. Cambridge University Press. p. 159. ISBN 978-0-521-45050-8. ^ a b Vane, C. H., et al. (2006). "Bark decay by the white-rot fungus Lentinula edodes: Polysaccharide loss, lignin resistance and the unmasking of suberin." International Biodeterioration & Biodegradation 57(1): 14-23. ^ "Wood Decay Fungi in Landscape Trees Management Guidelines--UC IPM". www.ipm.ucdavis.edu. Retrieved 24 February 2018. ^ Vane, C. H., et al. (2003). "Biodegradation of Oak (Quercus alba) Wood during Growth of the Shiitake Mushroom (Lentinula edodes): A Molecular Approach." Journal of Agricultural and Food Chemistry 51(4): 947–956. ^ a b Vane, C. H., et al. (2001). "Degradation of Lignin in Wheat Straw during Growth of the Oyster Mushroom (Pleurotus ostreatus) Using Off-line Thermochemolysis with Tetramethylammonium Hydroxide and Solid-State 13C NMR." Journal of Agricultural and Food Chemistry 49(6): 2709–2716. ^ Stamets, Paul (2000). "Chapter 2: The Role of Mushrooms in Nature". Growing gourmet and medicinal mushrooms = [Shokuyo oyobi yakuyo kinoko no sabai] (3rd ed.). Berkeley, California, USA: Ten Speed Press. pp. 9–11. ISBN 978-1-58008-175-7. ^ Vane, C. H. (2003). "Monitoring Decay of Black Gum Wood (Nyssa sylvatica) During Growth of the Shiitake Mushroom (Lentinula edodes) Using Diffuse Reflectance Infrared Spectroscopy." Applied Spectroscopy 57(5): 514–517. Schwarze, Francis W. M. R.; Engels, Julia; Mattheck, Claus (2000). Fungal Strategies of Wood Decay in Trees. Springer. ISBN 978-3-540-67205-0. White, Robert H.; Ross, Robert J. (November 2014). Wood and Timber Condition Assessment Manual (2nd ed.). Madison, WI: United States Department of Agriculture, Forest Service, Forest Products Laboratory. Retrieved 31 January 2015. Wasser, Zmitrovich I. V.; Engels, Tura (2014). Wood-inhabiting fungi (PDF). Fungi from different substrates / J. K. Misra, J. P. Tewari, S. K. Deshmukh, C. Vágvölgyi (eds). N. Y.: CRC Press, Taylor and Francis group.